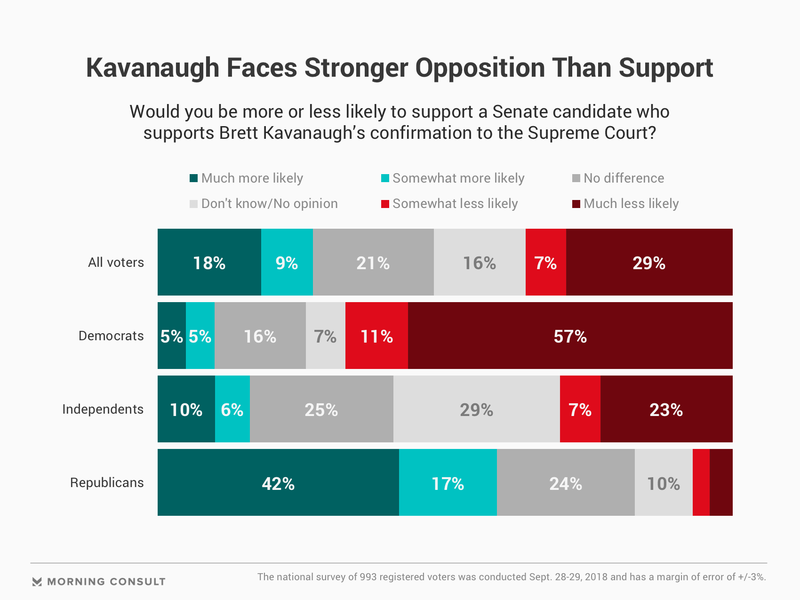 By a 9-point margin, voters more likely to back a Senate candidate who opposes Kavanaugh’s confirmation than one who supports it. 40% oppose Kavanaugh’s confirmation while 37% support it. Among Republican women, support for Kavanaugh’s confirmation rose to 69%. As a larger share of voters take sides on whether Brett Kavanaugh should be confirmed to the Supreme Court, a new Morning Consult/Politico poll finds the controversy over his nomination prompting stronger views among Democrats than among Republicans. By a margin of 9 percentage points, voters are more likely to back a Senate candidate who opposes Kavanaugh’s confirmation (36 percent) than one who supports it (27 percent). Fifty-seven percent of Democrats said they would be much less likely to support a candidate who backs Kavanaugh, compared with 42 percent of Republican voters who said they would be much more likely to back a Kavanaugh supporter. The difference in intensity was largely driven by opinions among women in each party: Sixty-one percent of Democratic women said they would be much less likely to back a candidate supporting Kavanaugh, compared to 35 percent of Republican women who said they’d be much more likely to support a candidate who backed him. The national, online poll was conducted Sept. 28-29, after Christine Blasey Ford’s sworn testimony to the Senate Judiciary Committee that Kavanaugh sexually assaulted her while the two were in high school in the early 1980s. Kavanaugh aggressively denied the allegation – scoring praise from President Donald Trump, who called his sworn testimony “powerful, honest, and riveting” on Twitter. Republicans in competitive Senate races such as Missouri and Montana have stood by the president’s embattled nominee, even after additional allegations, while Democratic incumbents in both states – Claire McCaskill and Jon Tester – have voiced their opposition due, in part, to reasons unrelated to the sexual misconduct allegations. Other Senate Democrats, such as Heidi Heitkamp in North Dakota and Joe Manchin in West Virginia, have not announced whether they will vote to confirm Kavanaugh as the Senate moves toward a possible vote pending an investigation by the Federal Bureau of Investigation. Among independent voters – an important voting bloc in the red-leaning states where Trump won in 2016 and Senate Democrats are seeking re-election this year– 23 percent said they would be much less likely to support a candidate who backs Kavanaugh compared to 10 percent who said they would be much more likely. Overall, the poll found support for Kavanaugh’s confirmation 3 points underwater, 40 percent to 37 percent. The deficit is unchanged from a poll released the previous week, but includes a larger share of voters weighing in one way or another, a sign that more people are paying attention to the issue. The latest poll, which surveyed 993 registered voters, has a margin of error is plus or minus 3 points. Among Republican women, support for Kavanaugh’s confirmation is now at 69 percent, up from 49 percent in a Sept. 20-23 Morning Consult/Politico poll of 1,966 registered voters, conducted before the hearings and some Republican leaders rallying behind Kavanaugh, and before additional accusers came forward. 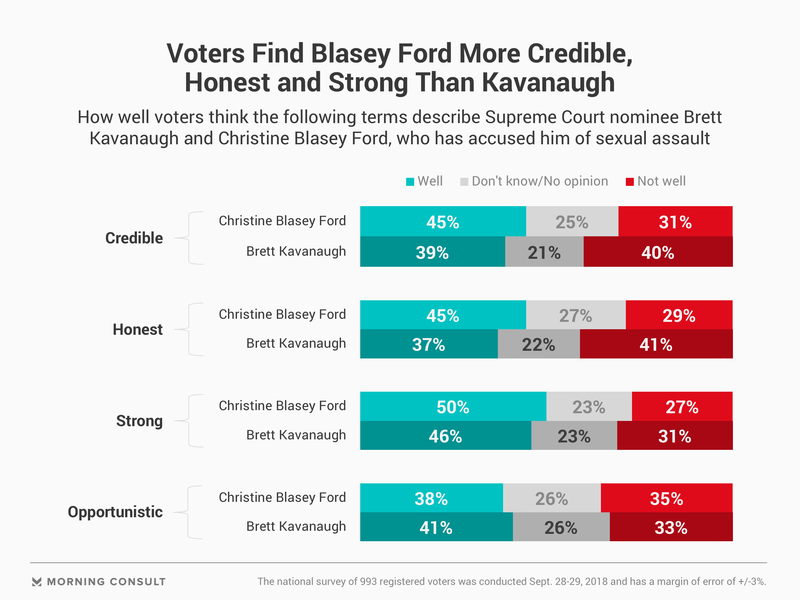 The new survey did not ask about additional allegations, but when it came to Ford, nearly two-thirds (64 percent) of Republican women said the term “credible” did not describe her well, compared to 15 percent who said it did. Overall, 44 percent of women said Ford was credible, compared to 30 percent who said she was not – numbers similar to the 45 percent of all voters who described her as credible and 31 percent who did not. Voters were split, 42 percent to 42 percent, on whether Kavanaugh’s nomination should be withdrawn, with Democratic support for his withdrawal (73 percent) mirroring Republican opposition to it (76 percent).